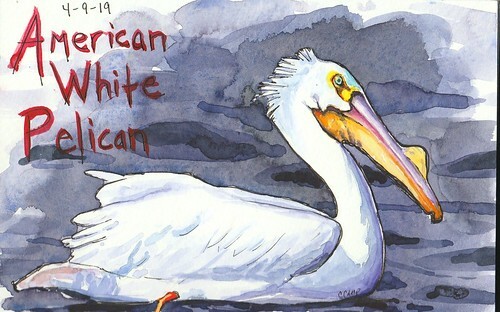 American White Pelican Watercolor – Let's Paint Nature! Was I seeing correctly? Was that a pelican on the water? A few days ago, on a spur, I drove out to Rock Run Rookery by myself. I’ve been there once before with ornithologists on a bird outing. It’s fun to listen to bird enthusiasts, especially knowledgeable ones who can identify birds by their call alone and not by sight. You want to be with one when trying to identify birds. Sure enough after some research I learned all about the migrating American white pelican (Pelecanus erythrorhynchos). 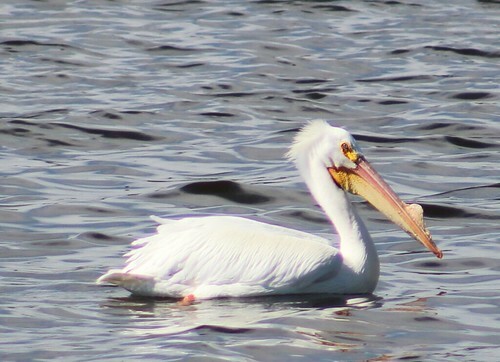 Unlike its cousin the brown pelican who is a coastal bird, the American white pelican migrates over land on its way to the Dakotas or Canada from Mexico. He is a very large bird (30 pounds) and his bill can hold 3 gallons of water. As he feeds, he skims the water collecting fish. He does not dive under water like his cousin, the brown pelican. And that hump on its bill? That means its breeding season. After breeding season is over, it will lose that growth. To look at him, you would assume he was completely white, but in flight he reveals his stunning black flight feathers. When I saw this creature, we locked eyes. There was a moment. As a faith based person, it is amazing to connect with wildlife and have a common bond with the One who created us. I can’t exactly put that into words, but some of you know what I’m talking about. Maybe that’s why nature is so important to me. It’s not just random cells on automatic pilot…it’s so much deeper than that. After my pelican encounter, I walked to the stream at the beginning of the park. Under the comfortable picnic shelter, I sketched the waters, oh so green. I don’t know why the water was vibrant green, turquoise like, but that is no exaggeration. 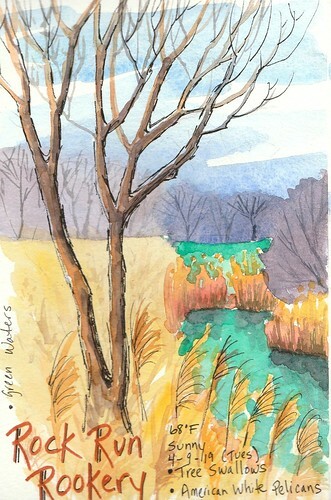 This section of the park was quiet, beautiful, and last year’s dried grasses made a marvelous tone. If you are ever in the Joliet area, I would advise a visit to Rock Run Rookery.